In Vienna, Christmas is celebrated with a passion, and what better way to commemorate the Festive Season than with a special gala evening of wonderful music and fine dining. The Kursalon Vienna is staging a Christmas Concert in the magnificent Lanner Hall on 24th and 25th December, which is then followed by an exquisite four-course dinner in the Kursalon's 'Das Johann' restaurant. The musical element of this seasonal package begins at 06.00 p.m. and features the Salonorchester Alt Wien performing a programme which includes favourites by Strauss and Mozart. This chamber orchestra is renowned for its dedication to the authentic performance practices associated with the Strauss family and the Vienna waltz tradition. The Kursalon was an important waltz venue in the days of Johann Strauss, and the chance to enjoy such music played in its original setting is a unique opportunity for those who appreciate Viennese culture. Once the concert is finished, music lovers can then adjourn to the elegant interior of the in-house 'Das Johann' restaurant at 08.00 p.m., where a sublime culinary experience awaits. The 'Das Johann' offers a menu of superb Viennese cuisine complete with local and international wines and many seasonal delicacies, amidst tasteful décor and a refined atmosphere which does full justice to the Italianate splendour of the historic Kursalon. Guests can choose between two options: the Category A Christmas Eve Gala experience, as described above; or the VIP Category which also includes a VIP reserved seat, a glass of sparkling wine during the concert interval, a Johann Strauss CD and a programme booklet. 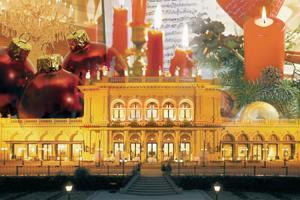 image Christmas Eve Gala / Sound of Vienna Konzertveranstaltungs Gesellschaft m.b.H.